In this chapter, Comyn analyses Virginia Woolf’s Mrs Dalloway (1925) and John Maynard Keynes’ The General Theory of Employment, Interest and Money (1936), revealing how both writers confront the dissolution of the British Empire and its consequences for homo economicus. Determined to question how economics functions in actual, everyday life, both writers portray the complexities and limitations of economic theory. Comyn argues that these texts show the significance of the empathic imagination for tracing the socio-economic relationships of individuals within a community, especially those individuals occupying the margins of society. 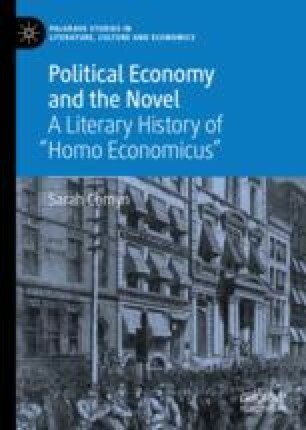 Studying the implications of time on human interactions, expectations and actions, and the imperfectability of equations—whether psychological or mathematical—this chapter demonstrates homo economicus’ incorporation within the particular, and the general, of post-WWI society.